Every day, millions of children cross busy streets on their way to and from school. Though parents trust the safety of their children to school districts and school officials, school-crossing injuries nevertheless occur, and often due to someone’s negligence. If a school or its officials or employees failed to provide your child with adequate protection at a school crossing and your child sustained injuries as a result, call school-crossing injury lawyer Jeff Killino at 877-875-2927 to learn about your legal options. Under the law of most states, schools have a duty to exercise reasonable care for the safety of schoolchildren when such children are under the school’s custody and control. Though school crossings are typically not on school grounds, schools that provide guards at crossings continue to exercise control over the safety of children who cross streets and roads with the aid of a school-provided crossing guard. The duty to exercise reasonable care for a student’s safety in such circumstances arises as a result of the school’s accepting the responsibility of providing crossing guards at certain intersections that are not on school property. Many state statutes specifically provide, however, that a school’s duty to protect children against crossing-injuries that occur after children have left school grounds arises only when a school has expressly taken on the responsibility of providing such protection. If a school crossing guard chosen by the school to assist schoolchildren in crossing busy streets or roads is negligent in the performance of crossing-guard duties, the guard, as an individual, may be held liable for injuries caused to a child as a result of the guard’s negligence. 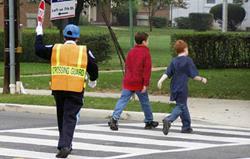 The school that arranged for the particular guard whose negligence is found to have been a cause of a child’s injury may also be held liable for a child’s injuries sustained as a result of a crossing guard’s negligence if the school is found to have negligently chosen and/or trained the crossing guard responsible. Though schools are generally not held responsible for injuries sustained by children at off-school crossings unless the school has taken on the duty to provide crossing-guard or other such protection for crossing children, schools and teachers have sometimes been found to be legally responsible for injuries suffered by a child who crossed an off-school road not provided with crossing-guard protection. If, for example, a teacher has kept a child in school past regular school hours and has reason to know that the child will cross an unprotected road after he or she is released, the teacher and the school may be found liable in negligence for the teacher’s creation of a situation that necessitated the child’s unprotected crossing. Injuries may also occur to children at school crossings as a result of something other than school or crossing-guard negligence. According to the National Highway Traffic and Safety Association (NHTSA), nearly 5,000 pedestrians, many of whom are children, die every year in traffic-related accidents. Contributing causes of such accidents include not only the negligence of drivers but poor sidewalk and street-pavement conditions, poorly marked intersections, malfunctioning traffic signals, and intersections without adequate signals. Thus, those responsible for maintaining sidewalk and pavements conditions, those responsible for providing and maintaining traffic signals and safety markings, and the manufacturers of traffic signals that malfunction because of a defect in manufacture or design may be held responsible for crossing injuries sustained by a child if the party’s negligence or the product’s defect is found to have been a cause of the child’s injuries. As a parent, your child’s safety is your highest priority. Though lawsuits against those responsible for a child’s injuries never truly compensate a parent or child for the injuries suffered, an award of damages can help a family pay for the costs of a child’s medical and other care and bring a family satisfaction by holding people responsible for their actions. When you take action against a school that is responsible for a child’s injuries, you help prevent similar injuries from occurring to other children. If your child has been injured at a school crossing through the negligence of a school, its officials, or employees, contact nationally-recognized child-safety advocate Jeffrey Killino at 877-875-2927 for expert assistance in obtaining the justice you deserve.